Toronto Real Estate Blog - GTA News : Fabulous Town House On Winston Churchill For Sale !! First Time Buyer Dream Home! • 4 bath, 3 bdrm townhouse "2-Storey" - MLS® $519,900 - Amazing Family Location! 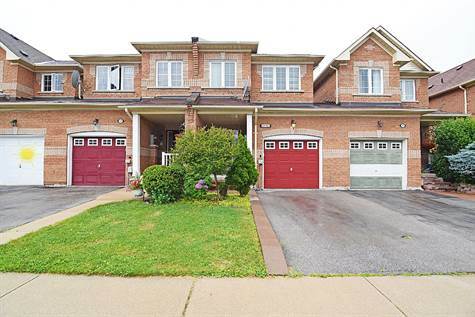 Eglinton/Winston Churchill, Mississauga - First Time Buyer Dream Home- This Gorgeous 3 Bedroom Row Townhouse In Desirable Erin Mills Is Ideally Situated For Family Life! Spacious Family Size Kitchen With Eat-In Breakfast Area, Double Sink And Walkout To Fully Fenced Spacious Backyard Yard! Great Entertaining Space! Spacious Master Suite Has A Walk-In Closet And Ensuite Bath With Separate Shower And Luxurious Oval Soaker Tub! Spacious Second and Third Bedrooms On Same Floor With Additional Ample Storage Space! 2nd Floor Laundry. Finished Basement With Open Concept Recreation Room And 2 Piece Bath. A Great Space To Relax And Enjoy Or Use As A Guest Suite! Just Move In And Enjoy! Designer Decor With Earth Tones And Attention Paid To Every Detail! Fantastic Locations For Commuters- Just Minutes To Highway 403, And Transit! This Neighborhood Also Boasts Great Schools, All The Amenities You Need, And Marco Muzzo Park Just Steps Away! Extras: Fridge, Stove, Built-In Dishwasher, Washer, Dryer, Electrical Light Fixtures, Window Blinds, Gas Burner And Equipment, Central Air Conditioning + Central Vacuum, Self Cleaning Water System, Barbecue Gas Line, Garage Door Opener + 2 Remotes. Are you a First Time Buyer? Let us help you navigate through the process. We'll help you Prepare a Budget - Select a Property - Ensure you are Taking Advantage of any Government Incentives. Buying A Home in Mississauga? Take Your Time - There are Some Spectacular Gems - Brand New or Newly Renovated. Call us to Find out when the Best Ones Come on the Market!